A few years ago, Technical Safety BC set out to eliminate incidents among its drivers. Almost half the employees are safety officers who conduct assessments at various installations, facilities, work sites and homes across British Columbia. Many of them drive long distances and go to remote places. “While we had experienced some minor incidents involving our fleet vehicles, we were more concerned with reports from the public about unsafe driving involving our vehicles. As a safety regulator, it is important that we model and promote safety at all times,” says Anna Matheson, leader of safety culture at Technical Safety BC. The Vancouver-based organization introduced a driver education and training program in 2013. About 180 employees — those who drive fleet vehicles and drive their own vehicles for work — have taken the program. “Over time, we have noted a considerable decline in reports from the public about unsafe driving involving our vehicles: From 22 reports in 2015, to nine in 2016 and down to three in 2017. We believe that the program has greatly raised awareness towards safe driving,” says Matheson. Every day, thousands of workers in Canada are required to drive as part of their job — across city streets, on busy highways, on rural dirt tracks and on construction sites. Motor vehicle accidents are a leading cause of worker deaths and injuries annually. In recent years, organizations seeking to reduce incidents have begun looking for new — and sometimes unusual — ways to enable and encourage their workers to drive more safely. According to WorkSafeBC, motor vehicle incidents (MVIs) are responsible for 33 per cent of traumatic deaths among workers in the province. MVIs are in fact the leading cause of traumatic worker deaths in the province. Each year, about 21 workers are killed and 1,339 are injured and miss time from work because of work-related crashes. In Alberta, the number of work-related motor-vehicle fatalities has risen over the last few years: 30 in 2017; 26 in 2016; and 19 in 2015. In Ontario, between 2007 and 2016, motor vehicle accidents remained the leading cause of traumatic deaths (36 per cent). When workers are involved in roadway collisions, their employer can be held liable for the resulting harm and damage caused by their employees due to negligence or illegal action. Provincial motor vehicle and highway traffic laws state the owner of a vehicle bears some responsibility for damage caused by the person driving the vehicle. Moreover, provincial OHS legislation and the Criminal Code generally require all employers to take every reasonable precaution to ensure workers’ safety. Employers in Canada have also been held liable for traffic accidents caused by employees under the common law. The cost of road collisions to employers is very high. According to the Insurance Bureau of Canada, there was $493.5 million in commercial auto insurance claims in 2016. In addition to insurance costs, employers will have to pay to repair or replace the vehicle. If the employee was injured in the crash, there may be workers’ compensation benefits, and the accident might lead to higher premiums. If the worker hit another vehicle or pedestrian, the employer may incur huge costs, including legal fees, to pay for damaged property and personal injuries. There are other possible costs, too: lost productivity, sick days, missed sales, damaged merchandise and a bruised reputation. Employers can reduce incidents by using a journey management process, which will help them find ways to limit employees’ exposure to driving-related hazards, says Rick Walters, fleet safety program manager at New Westminster, B.C.-based Road Safety At Work, a partnership between WorkSafeBC and the Justice Institute of B.C. Always begin by asking if the trip is really necessary. With many new types of communication technology available today, there may be safer alternatives to a road trip. Behaviour-based driver training is based on the idea that accidents are often the result of drivers’ immediate, emotional responses to other drivers’ actions, rather than lack of driving skills or knowledge of the rules of the road, says Spencer McDonald, president of Surrey, B.C.-based Thinking Driver. These responses can increase a driver’s level of risk tolerance and thus cause the person to take unreasonable risks. Through training, drivers become aware of the attitudes and thought processes that determine the degree of risk they are taking and the factors that influence their ever-fluctuating level of risk tolerance. “Behaviour-based driving training goes into the psychology of driving and looks at what is going on inside the driver. It moves beyond the mechanics of steering, putting on brakes and understanding laws and into the realm of what motivates the driver either to exercise that knowledge in a responsible, lawful and skillful way or to act based on emotion, impulse or other personal factors that drive them,” he says. Changing someone’s attitudes can be difficult, in part because attitudes are shaped by a person’s beliefs and values. Drivers in training are asked to examine their own beliefs about themselves, other drivers, their employers and even about road traffic. These beliefs influence their emotions they feel as they drive, and affect the level of risk they take. “For example, someone is driving their vehicle and another vehicle moves in front of them. This will offend some people, their sensibility of their right to space, their right to be first. And there’s a reactive mechanism that causes them to want to retaliate: ‘I will now follow you closely. I’ll flash my high beams. I’ll honk my horn. I will pass you, do the same thing to you and teach you a lesson.’ It doesn’t work, but that kind of thing can escalate into road rage,” says McDonald. Training is also geared at changing the way drivers see other drivers’ behaviour and motivations. While people quickly excuse their own driving misdeeds on the road, they tend to see the same action, when done by another driver, as the result of a character flaw or negative motivation. “(But) maybe they’re just a poor driver and they are doing their best,’” says McDonald. In the last few years, more employers have turned to new technologies to help reduce vehicle incidents. Telematics refers to the use of communications and information technology to transmit, store and receive information from telecommunications devices to remote objects over a network. The connected device plugs into the vehicle and obtains all kinds of data from control units, such as productivity, maintenance, location and driver performance, says Sherry Calkins, associate vice-president of strategic partners at Geotab in Oakville, Ont. The driver behaviour data most commonly tracked by Geotab’s device is buckling the seatbelt, speeding, harsh braking, harsh accelerating and sharp cornering. “All of that data is being collected in real time from the vehicle and then being exposed through a software platform that businesses can log into to see their dashboard. And they can receive the information either from a desktop computer or from a mobile device,” says Calkins. All data regarding the driver’s performance goes into a Driver Safety Scorecard Report, which rates the driver based on performance. Fleet managers and supervisors then know which drivers need coaching and which areas need improvement. The device also coaches the driver in real time. When a driver violates a rule — fails to buckle up, for example — the device automatically sends an audible alert to the cab that identifies the violation. “The audible alert will continue to beep until they latch the seatbelt. Once they latch the seatbelt, the notification will stop beeping at the driver. It is in real-time coaching that we see significant improvements in drivers’ behaviour,” says Calkins. An add-on that uses text-to-speech technology identifies the exact violation in spoken language and in wording determined by the employer. 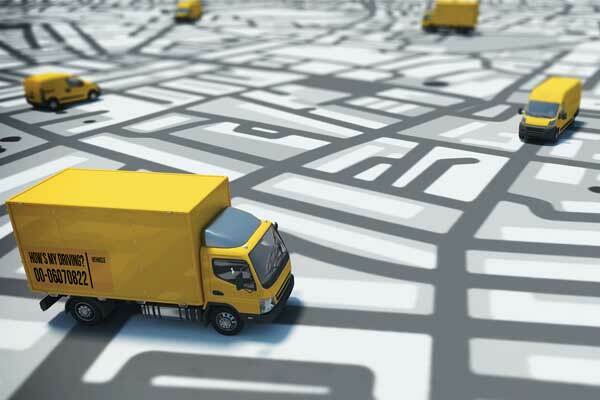 Telematics can be combined with other technologies, such as cameras and sensors, to collect even more data. For example, cameras mounted in the vehicle cab can monitor head and eye movements to detect fatigue, distracted driving and other problems. The system will notify the driver and also send a notification to a supervisor. Another system, called a collision avoidance device, attaches to the inside of the windshield and sends visual and audible alerts to the driver, warning of impending collisions, unsafe lane changes or following too close. The last three years have seen a greatly expanded adoption of telematics, Calkins says. Currently, the technology is used most heavily in the oil and gas, construction and delivery industries. The costs of both implementation and monthly recurring fees have been declining, she says, and the use of telematics is likely to rise. According to a 2017 survey of 260 companies done by Teletrac Navman in Garden Grove, Calif., 81 per cent of respondents were already using telematics or planned to use them in 2018. Of the 62 per cent who said they were planning to invest in more technology, the two most popular systems were fatigue monitoring and machine vision, cameras and sensors. Among the items organizations monitor, speed was near the top (61 per cent of respondents), followed by driver hours (53 per cent), driver performance (37 per cent) and harsh braking (17 per cent). Of the most important benefits actually realized, respondents identified improved driver behaviour (37 per cent of respondents), improved driver safety (16 per cent) and fewer accidents (four per cent). Distraction and fatigue are significant contributing factors in road crashes, says Robyn Robertson, president and CEO of the Traffic Injury Research Foundation in Ottawa. Approximately 300 Canadians are killed each year as a result of distraction, and fatigue is estimated to play a role in about 20 per cent of crashes, she says. In recent years, all jurisdictions in Canada (except Nunavut) have enacted distracted driving legislation, making it illegal to use any hand-held electronic device while driving. Conviction can lead to fines up to $1,200 and assignment of three to five demerit points. Employers that do not take reasonable precautions may be held liable if a worker is injured while driving and using a hand-held electronic device. A wide variety of phone applications are available to help drivers reduce distractions behind the wheel. Once activated — either automatically when the vehicle reaches a certain speed or manually when the driver enters the vehicle — the app blocks calls and texts and may disable other phone features, such as email and camera. The app sends automatic replies to texts letting the sender know the recipient is driving. The driver is usually limited to two or three apps, often just navigation and music. The driver can also choose a few contacts who can call in. Some apps have a corresponding website that allows another person to monitor the use of the app. Instead of blocking calls and texts, some apps turn text messages into audio, reading the messages aloud. The driver can then select a response from a list of replies to send a text back. Of all organizations that offer rewards to drivers for better performance, more than one-half experience fewer safety violations and accidents. The reward may be a financial benefit, such as gift card, or it may simply be a mention in the company newsletter. While it’s necessary to take corrective action with employees who do not follow company policies and procedures, Walters says, it is perhaps more effective to recognize those employees who do. Rewards programs can be tied to a driver’s smartphone. A mobile app records driving behaviour events, such as phone usage, speeding, hard braking and aggressive acceleration. Drivers in the fleet are scored and ranked among their team members. The top performers and most improved drivers are automatically rewarded each week with gift cards. Some fleet managers are looking not to rewards but to deterrents to encourage safe driving behaviour. A company in the United States recently introduced a policy of requiring drivers to pay a deductible of US$250 to $500 when they are deemed at fault for an accident or when the collision is ruled as preventable. The purpose of the policy is to increase driver accountability. “This has made our drivers more aware of the importance of driver safety and demonstrates (our company’s) commitment to safety by addressing these accidents one by one. The number of at-fault accidents has even gone as low as zero for a few months,” the company’s HR operations fleet manager, Yolanda Johnson, was quoted as saying. One interesting way safety managers are trying to reduce incidents is through safety ride-alongs, in which managers accompany employees on a drive. In addition to their behaviour-based training, Technical Safety BC introduced the ride-along as an annual practice a few years ago. A leader or joint occupational health and safety committee member rides along with an employee to check safety requirements, including vehicle operation, vehicle safety inspection and safe driving and parking practices, Matheson says. Among the factors affecting risk tolerance that drivers in behaviour-based training are asked to examine is time pressure, McDonald says. When drivers are on the road and start worrying about being late and want to speed, they are told to shift their attention away from being late and consider the bigger picture. “That’s the contrast between what I want in the moment and what I really want long-term. What is really important to me? It’s important to me to make it to the meeting on time, but what is really important is that I arrive and I’m home with my family tonight,” he says. A road risk policy demonstrates your organization’s commitment to road safety and provides a framework for managing and reducing your road risk. • be as concise and to the point as possible.